After years of tearing up the rodeo circuit—and shirking his family duties—Colton Hart shouldn’t be surprised that his return to Thunder Ranch has been a bit thorny. His plan to put the Harts’ prize stallion, Midnight, back into dangerous rodeo competition doesn’t help. Colt’s stirring up trouble off the ranch as well, especially in Leah Stockton‘s heart. Recently divorced, Leah is determined to make a new life for her two kids. The last thing she needs is a man who acts like a child himself. And Leah doesn’t even know about the biggest mistake of Colt’s life. When his shameful secret is revealed, she’ll never look at him the same again. But Colt also realizes it’s past time he acts like the man Leah deserves…whether she wants him or not. I love writing about secrets. In this book, there's a big one, and the hero Colt Hart, has been hiding it so long that the weight of it is crushing his heart. If you like horses, you're sure to fall in love with Midnight, the stallion the Hart family acquired in a heated bidding war in book one of the series. Will he be worth all the money they paid for him? I wrote this story as a collaboration with 5 other authors. Orchestrating the process was Senior Editor Kathleen Scheibling and I want to thank her for creating the Hart family and for setting the story in the most perfect ranching town possible: Roundup Montana. Thanks also to my editor, Johanna Raisanen for believing in me and inviting me to contribute to this series. And mega thanks to the other talented authors who also contributed stories. It was so much fun building the world of the Hart family with Cathy McDavid, Roz Denny Fox, Shelley Galloway, Marin Thomas and Linda Warren. Clouds were rolling over the hot afternoon sun as an exhausted Colton Hart pulled up to Thunder Ranch in his brand new Dodge Ram truck with his weathered 22-foot Airstream in tow. A big party was going on at the Hart’s ranch house this evening, and second son, Colt, was late. Not just a few minutes late, but hours. And it wasn’t just any party, but a wedding celebration. His eldest brother Ace had married local ranching girl Flynn McKinley that afternoon. They were madly in love and already expecting a baby. Well on their way to having a perfect life. 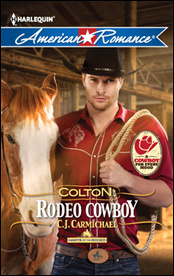 Something Colt--despite all the rodeo buckles he kept winning--would never have. He should have cut-out early from the Rodeo in Central Point and been here in time for the civil service. He knew that. The five thousand dollars he’d won simply wasn’t worth the price--though he did need that money in his checking account before the first of the month. No running from that cold, hard fact. Of course the hour delay due to construction on the I-90 hadn’t helped. Colt parked the new truck in the lot his mother had given him, about three hundred feet west of the homestead property. He didn’t bother unhooking the trailer or re-connecting the water and power. No time. Inside his trailer, he tossed his dead cell phone on the counter, then added his latest buckle to the collection in his bottom bureau drawer. He’d been gone so much lately the calendar taped to the mirror was still on March. He tore off a couple sheets, then pulled the truck keys from his pocket. Early that spring he’d won the use of the fully-loaded 2012 Dodge Ram for an entire year. He’d never driven, let alone owned, a brand new vehicle before. The luxury was in danger of becoming addicting. He just might have to buy out the lease at the end of this year--if he could afford to. He took a few steps to the kitchen where he ducked his head over the sink and splashed water from a plastic jug over his unshaven face. God, but he’d love a shower, but there was no time for that luxury. Instead, he made due with a change of clothes, clean Wranglers from his closet and his trademark red chambray shirt. Colt put on his hat, then stepped out of his trailer into the muggy heat, the heel of his boot sinking into the pine-needle, packed earth. The air was rich with the scent of growing things, tinged with the hickory flavor of his Mom’s famous barbecue beef. Clouds continued to gather and from the far-off distance, he heard the muffled sound of thunder. It had been a wet spring, now it looked like more rain was coming. Hopefully the storm would hold out a little longer. A path led through the Engelmann spruce toward the main house and he followed the well-trod route, ribs complaining with each breath, muscles everywhere sore and achy. He lived for the thrill of competing in the rodeo arena, but he had to admit the sport was hell on his body. The path ended at a fork. Ranch house to the left. Barns and various other outbuildings to the right. Royce, a long-time ranch hand in his sixties was sitting at one of the picnic tables that the hired help used for breaks, having a smoke. “Party going on at the main house,” Royce said. Royce turned his head, took another pull on his cigarette. Colt waited a second longer. It would only be courteous of Royce to ask how things had gone in Oregon, but Royce didn’t say a word. Probably pissed off, like Ace, that Colt wasn’t around more to help out at the ranch. But he had financial obligations none of them knew about, and he had to earn extra money somehow. Colt continued on his way, coming round the back of the house where sparkly lights framed the outdoor pool and the large flagstone sitting area. Outdoor speakers were playing Lady Antebellum’s hit song--something about a kiss--while Ace and Flynn fed each other pieces from the wedding cake. They looked good together. Happy. In love. Captivated by the sight, Colt watched them for several long moments, before he had to turn away. He felt as if he’d landed face-down in the rodeo arena: throat choked, eyes watering. He couldn’t say why their happiness moved him so much. He wasn’t one for tears. Or so he’d thought. He switched his attention to the rest of the family. His Mom and Uncle Josh sat at the head table with Josh’s sons Beau and Duke and Colt’s sister Dinah. Missing was younger brother Tuf, in limbo after serving in the Marines. Wouldn’t it have been great if Tuf had somehow showed up for the wedding? No one would have paid Colt much mind if his younger brother had finally returned home. Colt stepped out of the shadows just as the clouds decided to dump buckets of water onto the scene. No mere shower--this was a deluge. Holding his hat with one hand, shielding his eyes with the other, he dashed with the others toward the open doors that led inside. He noticed Ace grab Flynn’s hand. “Where are we going?” she gasped. Strange choice, Colt thought. But Flynn started laughing and the two of them, so crazy-in-love Colt supposed they were beyond logic, dashed off for the stables. At least this way he wouldn’t have to face his brother right away. He knew his excuses for missing the wedding were going to sound mighty lame. Maybe it would be better if Ace didn’t have to hear them until after his honeymoon. He grabbed what remained of the wedding cake from the table and stepped into the house. Next thing Colt knew, he was face-to-face with his mother. His Mom brushed back a strand of her dampened, silver hair. When had the color changed? He couldn’t remember, but it had been a long time ago. Worries had come early to Sarah Hart’s life. A rancher’s life was not an easy one and his father’s premature death had placed most of the pressure directly on her shoulders. Apparently, the stress had been hard on her heart, too. About a month ago she’d had a scare which had sent her to the hospital. Colt had been worried sick then, was still worried now. What would he do--what would any of them do--without their mother in their lives? The very idea was unthinkable. He wanted to hug her, and tell her how much she meant to him. But he’d screwed things up. Again. Her expression was as angry as he’d ever seen it. Colt held his tongue, acutely aware of the others. The family room where they’d all rushed to escape the rain was large, but not so large that everyone couldn’t hear their conversation. His sister Dinah, grabbed the cake out of his hands, then shook her head as if to say, you’ve really done it this time bro. Cousins Duke and Beau were looking desperately in opposite directions, clearly wishing they were anyplace but here. While Uncle Josh seemed sad and disappointed, maybe the hardest reaction of all for Colt to deal with. Colt took a deep breath. No sense telling them about the construction delays. Or the meeting that had run late, but would hopefully lead to a lucrative deal for their new bucking stock program. At this point anything he said would just sound like an excuse. “Yeah? Watch me.” No one called out his name a second time, least of all his mother. Not that he expected them to. He’d left too much to chance, given himself no cushion for the unexpected. But contingency planning had never been his long suit.